Add classic style to your wardrobe with the The Kooples™ Long Sleeve Button Up Shirt, Covered in Blue Daisy Print. Mock collar decorated with soft, ruffled detail. Long sleeves with elastic cinched cuffs and ruffle accents at each shoulder. Vibrantly colorful floral print featured throughout. 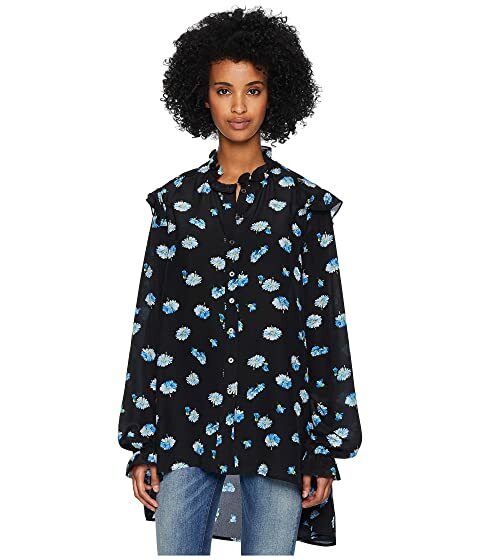 We can't currently find any similar items for the Long Sleeve Button Up Shirt, Covered in Blue Daisy Print by The Kooples. Sorry!